If you were the general manager of Notre Dame, would you trade Malik Zaire for Florida Gators’ linebacker Jarrad Davis and wide receivers Joshua Hammond and Dre Massey? I can’t argue with the subjective part, but this is a terrible hypothetical deal for Notre Dame. Malik Zaire is a talented quarterback who is returning from a season-ending ankle injury. Under Zaire’s brief leadership, the Irish offense was more productive than it was under DeShone Kizer (when comparing equal playing time). Zaire hasn’t fumbled the ball or thrown an interception. He’s also a charismatic fellow who may well become a team leader. 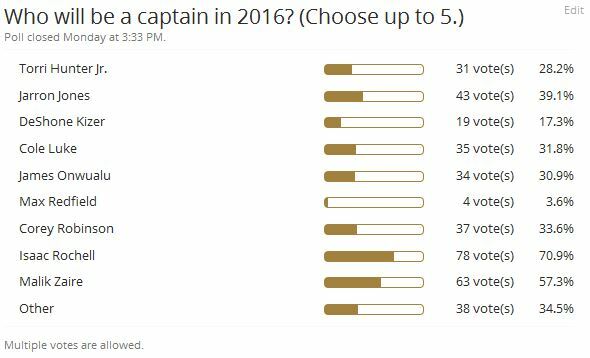 A recent poll of Blue & Gold Illustrated readers picked Zaire as the second most-likely captain this coming year. I don’t know who Coach Brian Kelly will tap to start the season at quarterback. Even if it’s Kizer, it’ll be nice to have Zaire if Kizer struggles or is injured. Even if Kelly decided not to redshirt sophomore Brandon Wimbush, his options for backup would be Wimbush (who has attempted five passes in his college career) and true freshman Ian Book, a three-star prospect. Jarrad Davis is an outstanding weak-side linebacker who registered 98 tackles, 4 hurries, 11 hits & knockdowns, and 3 sacks last year. The Irish lost talented junior WILL (weak-side LB) Jaylon Smith to the NFL. Smith had 113 tackles, five pass breakups and six QB hurries last year. Smith’s backup was Te’Von Coney, who saw limited action before replacing the injured Smith in the Fiesta Bowl. Coney then injured his shoulder in the same game and was replaced by the now-departed Jarrett Grace. Coney will likely battle redshirt freshmen Josh Barajas and/or Asmar Bilal for the WILL position, with Coney the favorite if he’s healthy. Davis would undoubtedly start if he was Irish. But his absence would hurt the Gators tremendously. Davis’ backup at Florida is senior Daniel McMillian. Beyond those two [Davis and senior Alex Anzalone], the depth really drops off quickly. Both McMillian and Rolin have some experience now as fourth-year players, but neither has been productive at all on the field. Injuries have kept Rolin from getting up to speed, while McMillian frequently finds himself in the wrong position to make a play. For the Gators to be good at linebacker in 2016, Anzalone must stay healthy and some of the younger players like Jackson, Reese and the other freshmen coming in this summer need to be able to play some snaps. Joshua Hammond is a freshman wide receiver who plays the X (split end) position, where the Irish also lost a player to the NFL Draft – Will Fuller. But the Irish have the gifted Equanimeous St. Brown, senior Corey Holmes and freshman Kevin Stepherson at that position. Javon McKinley, who could also play there, was rated higher than Hammond in 247Sports’ composite rankings. Chase Claypool, another Irish signee, was rated one slot lower than Hammond. Dre Massey plays a mixture of slot, running back and kick returner. He was Scout’s 22nd best junior college player in 2015; Notre Dame, to my knowledge, has never recruited a junior college player. Massey is expected to challenge for a starting role in the Y (slot) position at Florida; the Irish have Torii Hunter Jr. and the speedy C.J. Sanders there already. Thankfully, David Kenyon is not the general manager of the Notre Dame football team and there are no trades. Because this would be a lopsided one in favor of the Gators. Zaire’s departure would leave the Irish in a tenuous position if Kizer struggled or was injured. With Kizer running the ball nearly 120 times last year, his chance of being banged up is pretty good. Add in the fact that only one QB has played a full season under Kelly (Tommy Rees in 2011), and you could see why the Irish would be reticent to deal Zaire. What they give up – stability at the most important offensive position – would not be worth what they got back – a stud linebacker and two wide receivers with great potential (but not much else). The move would hurt the Gators at linebacker, although their wide receiver corps would function fine without Hammond or Massey. The Irish have plenty of depth at wide receiver. What they need is an explosive edge rusher or a shut down corner. Make the trade! Zaire is an erratic passer. Kizer was trending down at the end of the season, so our most talented QB, Wimbush, can win the job this spring. Oh, wait! I forgot that our genius head coach is going to redshirt him. Brilliant! Don’t give him a chance to win the job. Forget that ” reps ” nonsense. Kelly will automatically put his best QB on the shelf. But this is no surprise for Kelly. He didn’t fire the incompetent BVG and he hired a brilliant young offensive mind, Mike Sanford, that even Urban Meyer wanted to hire, and he refuses to let him call the plays. Virginia and Syracuse put out head coach feelers to Sanford after the past season, but genius Brian won’t even trust him to call the plays. Our opponents can rest easy: Kelly is in charge of ND QB’s. Ah, it has been a while since the “backup QB is the best one on the roster” sentiment popped up. Like the changing seasons, it’s always good to see the signs of spring. The play calling is in safe hands. Think: Tulsa 2010; Northwestern 2014; and play calling wizardry in the red zone. I recall QB guru Weis having a few bad games vs. syracuse & uconn, but I’d point to the overall record and say the present staff is an upgrade from that one. Do you have a better head coach in mind, or are you content to nit pick the current decision makers? I don’t have a strong opinion either way; just wanting to get your perspective/outlook. Urban Meyer is on record as saying that ND was his ” dream job”, and that was while he was still at Florida. He made a mistake and told the truth. He went into major damage control and said how he loved Florida and how he planned to be at Florida for a long time. A year later he was gone. By all accounts our failure to land Meyer in 2004, hinged on not giving him more leeway on admissions. Meyer’s love of winning superseded his love for ND. If we landed him then, we would have been a monster program ever since. Meyer is such an astute coach that he would have won even with less talent than some of the traditional football factories who ignore admissions ( Are you listening, Nick?). Well since Urban and Nick are out of the picture, Kelly is about as good or bad as we can do. That doesn’t mean that he isn’t in over his head at ND. He is. However, given his limitations there are still steps that he could and should take: Fire BVG immediately-old friendships must not preclude good judgment; allow Mike Sanford to be the one and only play caller-Kelly must realize that a big upgrade is needed, especially in the red zone; and, finally, give Brandon Wimbush a chance to compete for the job this spring. Do I think that Kelly would make such changes? So, sorry to say, for the near future at least, dreams of national championships, like dream jobs, are just a figment of our imagination. How about Zaire and Kiser in the same backfield? Also add another running back with them and they could be unstoppable! It’s the silly season – the NSD is in the rear-view mirror, it’s at least a few more weeks until spring practice starts. Solution – write something silly.